It's been a while since I last blogged - babies do take up quite a bit of time, but things are getting much easier now and he is letting me put him down for more than 5 mins at a time! When Charlie was born we had some difficulties getting to grips with breastfeeding and so my lovely friend lent me her book - The Womanly Art Of Breastfeeding. This book has been my lifesaver and when I felt like giving up breastfeeding completely it really helped me to focus and give it another go. I am so grateful for this book, without it I would probably be using formula now. I don't get a lot of time to watch TV! I tend to have This Morning on in the background in the mornings but in the evening hubby takes over the TV! I was out the other week in town and popped in to Superdrug where they had Les Miserables for £9.99. Hubby wouldn't come to the cinema with me to see it as he hates things like this so I hadn't seen it. So I got the DVD and managed to watch it whilst hubby was out last week. It is amazing! I didn't know what to expect but it is really good. I wasn't too keen on Russell Crowe as Javier but the rest of the film was fab. Whilst I was still pregnant I bought a few bits of clothing with some Christmas money I had been given to save for after Charlie was born. 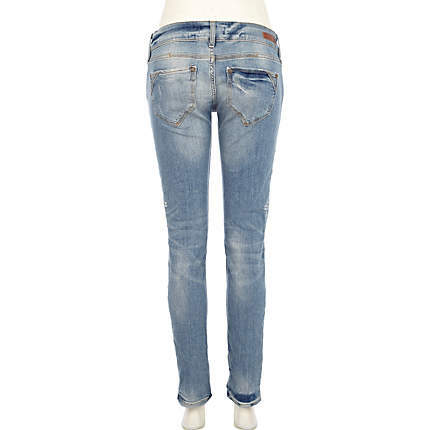 One of them was these jeans from River Island. I love them! Even better I had to return them and get a size smaller as they were too big after pregnancy as I lost so much weight to begin with, down to breastfeeding I think. So I am loving wearing these, they are skinny but stretchy and I love the pattern down the side of them. As I am not watching much TV I have started downloading more music onto my iPhone, especially to listen to in the car. Charlie seems to be soothed by music, particularly Empire State of Mind! But my favourite track at the moment is Still Into You by Paramore. It seems a bit cheesy but I think it sums up hubby and me at the minute. This has to be Charlie! He is my world and I cannot believe I made him! I miss him when he is in someone else's arms, which I know is stupid, but I just can't get enough of him. He is really growing up now and has begun to smile and laugh quite a bit. He is still small in weight for his age, but he is gaining weight well so no one is concerned about him. He has such as wonderful little personality and he loves to play, especially with his daddy. He sits and talks to his animals and it is just the most wonderful sound! 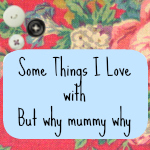 If you would like to join in with Some things that I Love, please pop along to butwhymummywhy.com and click the linky to enter.